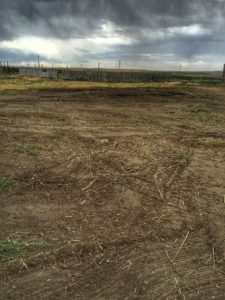 We’re spending the week in Rock River, Wyo., helping rejuvenate a ranch to modernize the cattle operation. 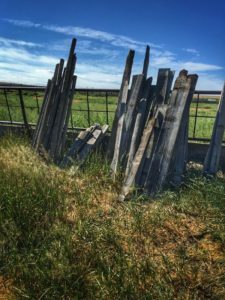 This is a more creative project–we aren’t using new pipe or continuous fence, we’re repurposing materials that have been on that ranch for decades to make modern sorting pens and alleyways. It’s an honor and a privilege to help these families with this property because it’s really something special. We could spend days just exploring the barns and pens, finding little bits of Western history along the way. Plus, it’s great to get away from the hustle and bustle of the Front Range for a few days–the silence is golden here in Rock River. 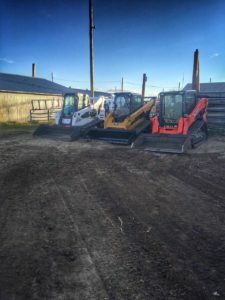 We’ve got three skid steers running clearing out weeds and debris in the future sorting pens. In just a few days this will be ready to sort hundreds of pairs. Some weathered barn wood ready to salvage from the old corrals. Progress in Rock River, Wyo. Mike and I want to say thank you to you and your dad! You guys are doing a fantastic job and are so thorough with your work. Thanks again, we can’t wait to see and use the finished products. Thank you Shea! This place is unreal–glad to be a part of making it user-friendly for you guys. Ropers’ Dream in Sedalia, Colo.
Merry Christmas from Shaffer Fencing!